Kyo-komono Kinugasa was established in 1968. For more than 40 years we have been retailing high-quality design products using traditional Japanese kimono textiles. 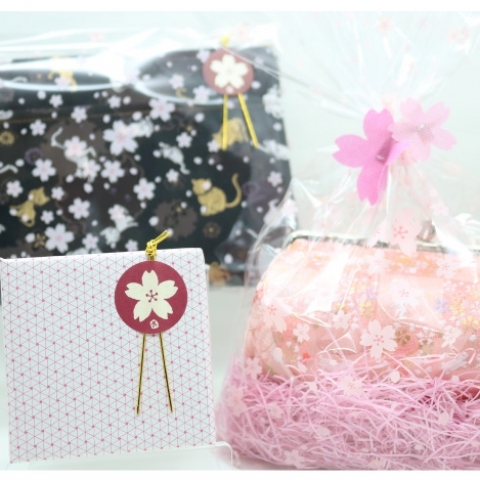 We would like to invite you to choose your own one-of-a-kind souvenir at Kinugasa. There is parking space for two cars in front of the store. Tuesday. Busy seasons will be open every day. Please check "news" in our website before visiting. From 9：30 a.m. to 17：30 p.m. This hexagonal box was originally used among Buddhist monks to carry incense, now it can be used as a jewellery case with a small scented bag. Made of Kinran, or Gold brocade, a special technique in Nishijin Brocade (yarn-dyed figured fabric). Pouch, purse, pen case, camera case and others, made of Kinran fabric. These products are made with vinyl-coated cloth on the back side, good for daily use. We have many kinds of incense,sachet, aroma diffusers, fragrance gels and aroma candles. Made of Kimono Fabric or Washi (Traditional Japanese paper), glass beads, which is also good for daily use. 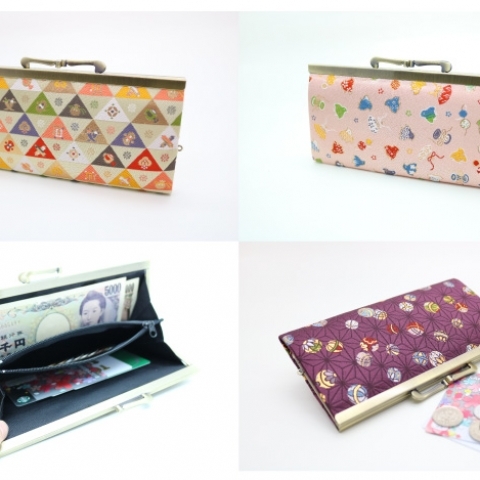 Various kinds of materials and size of Gamaguchi, from a small purse to a big gamaguchi bag. Furoshiki (wrapping cloth) can be used for gift wrapping, grocery shopping bag or simply as decor. Choose from a wide variety of sizes and designs to complement your lifestyle. Tenugui (washcloth) is a type of traditional Japanese towel which can be used in various ways other than for just drying your hands or body. They come in an endless variety of patterns, from lucky charms in humorous designs to colorful artistic designs. They also go nicely with Japanese style interiors as a tapestry. A sensu is a Japanese folding fan. There are many types of fans from high quality Kyo-Sensu to casual fabric Sensu in our shop. 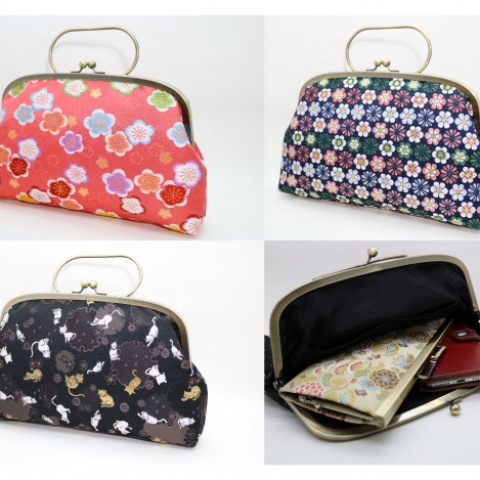 We have also kimono bags, leather items, stationery, cosmetics, tapestry, small curtain, Japanese tea utensils and other products made in Kyoto. Kyo-Komono Kinugasa is located in the Kinukake-no-michi Road area, the historic path that runs through the foothills of northwest Kyoto, and links three World Heritage Sites – the temples known as Kinkaku-ji, Ryoan-ji, and Ninna-ji. "Kinukake" – means literally "draped with silk" - the name derives from the famous demand by ninth-century Emperor Uda that he be able to gaze out on a snowy landscape even in mid-summer, which was fulfilled by covering the slopes of the nearby mountain with white silk. Not only historical sites, but several museums and cultural spots such as Domoto Insho museum, Kyoto museum for world peace and Ritsumeikan University lie on this road. Please enjoy a pleasant stroll in this scenic area, popular since ancient times. Kinkaku-ji, the Temple of the Golden Pavilion, is one of the most iconic sights and popular attractions in Japan. It was built by Ashikaga Yoshimitsu, the third shogun of the Muromachi shogunate, in 1398. This temple is a three-story building on the grounds of the Rokuon-ji temple complex, the top two stories of the pavilion are covered with pure gold leaf. The pavilion successfully incorporates three distinct styles of architecture which are Shinden-zukuri, Buke-zukuri, and Zenshū-butsuden-zukuri, specifically on each floor. Although Kinkaku-ji was designated a national treasure in 1929, its time in the incarnation for which it was honored proved fleeting: a novice monk set fire to the structure in 1950. That event, in turn, was fictionalized by Yukio Mishima in his signature masterpiece of contemporary Japanese literature, The Temple of The Golden Pavilion. Kinkakuji Shariden was rebuilt in 1955, 5 years after the incident. Kinkaku-ji was recognized by UNESCO as a World (Cultural) Heritage site in 1994. Ryoan-ji was founded by the Muromachi Period military leader Hosokawa Katsumoto in 1450. The temple belongs to the Rinzai Zen Buddhist sect, and its karesansui (dry landscape) rock garden is the most famous Zen garden in Japan. The temple’s signature rock garden is believed to have been created sometime in the late 15th century, but the identity of its designer is a mystery, and what it means or is intended to represent has remained a matter of speculation across the centuries. The popularity of everything Zen in the West began with the works of D.T. Suzuki. Eventually, the trend grew into the worldwide "Zen boom" of the 1960s and 70s, culminating in an official visit to Ryoan-ji by Queen Elizabeth II. Her effusive praise for the rock garden helped establish Ryoan-ji as the embodiment of Zen thought in the world’s collective imagination. In the teahouse garden lies a stone basin known as a tsukubai, traditionally used for washing hands before participating in the tea ceremony. The Ryoan-ji tsukubai is famous for the poetic Zen saying chiseled on its surface of its frame, and the fascinating device by which the thought is conveyed. The four characters surrounding the central opening – read ware, tada, shiru, taru –take on their meaning only when combined with the opening, which is in the shape of another character. The four outer characters can be translated as "I," "learn," "only," "to be content." This expresses the quintessential Zen view that richness of spirit comes from "learning only to be content" – knowing satisfaction instead of longing, and being happy with what one has. Those who recognize their blessings are contented and spiritually fulfilled; the dissatisfied, who cannot control their desires, are spiritually impoverished. Ryoan-ji was recognized by UNESCO as a World (Cultural) Heritage site in 1994. The 59th Emperor of Japan, Emperor Uda, abdicated early in the Heian Era. He then took the monk’s vows, founded the Ninna-ji Temple in 888 AD, and retired there as its head priest. In this capacity, he constructed a residence known as Omuro. Ninna-ji is a famous site for cherry blossom viewing during the spring, not least because it is the last location to bloom in the city of Kyoto. These unique cherry trees at Ninnaji Temple called Omuro sakura, only grow to a height of about 2 meters. They have been enchanting visitors for more than 400 years. Ninna-ji was recognized by UNESCO as a World (Cultural) Heritage site in 1994. 22 Mar 2019 ■春ギフト2019■ 無料で桜ラッピングいたします! © 2015 Kinugasa Co. Ltd.